How can something feel calm and colourful at the same time? Artist Gwen Card somehow captures the magical light hiding deep in a lovely iris or in a face and brings it to life on a canvas. love. Gwen’s golden retriever passed away several years ago and she wanted to paint him in his memory. People saw the picture and commissioned paintings. It’s the transparent layers of paint that help Gwen to capture the light so well. Rather than mix paint colours in the tray, she works slowly over several weeks to layer different transparent colours on top of each other to reach a unique effect of visual depth. “I like to get more intimate with my work and stop to smell the roses.” Gwen’s skill has been recognized several times, including at Paint Ontario where in different years she has received an Honourable Mention, Second Place, and the Rosemarie Crosswell award. 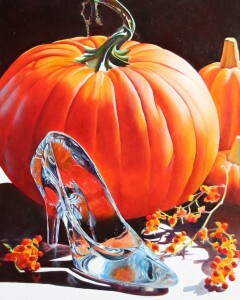 You can see Gwen Card’s art on her website – www.thefrontporchartstudio.com.